Nice and convenient. Nice well maintained 2 bedroom 7th floor apartment on the beach. Everything close. Service good. Parking good. Room facilities good. Need better pillows... ie far too soft. Some people actually like something a bit firmer. Will be using again for sure. 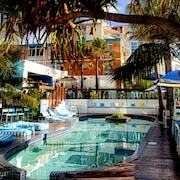 Good days are those where the most difficult decision you have to make is which hotel to book. 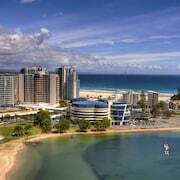 And if you're planning to visit Coolangatta, 20 kilometres from central Gold Coast, you have a pretty awesome range to select from! Sure, you could spend your long-awaited break doing nothing but relaxing with your feet up and a refreshment in hand, but you'd be seriously missing out. Gold Coast is home to unmissable sights, like Sea World, Dreamworld and Warner Bros. Movie World. Don't skip them! Grab your camera, swimmers and sunnies, and make your way to Duranbah Beach for a relaxing day in the sun. After a big day exploring, rest your head at a comfy hotel close by. The Reflection on the Sea and Reflection Tower Two are two awesome options. Point Danger is an excellent point where you can look at the natural elegance of the area. 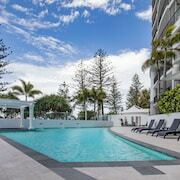 You can drop your suitcase and enjoy some shut-eye at the Sebel Coolangatta and Tweed Ultima if you're thinking of visiting this attraction. Everyone has holiday horror stories about the most uncomfortable mattress you can imagine and creepy-crawly infestations. But believe us, cheap doesn't have to mean nasty. 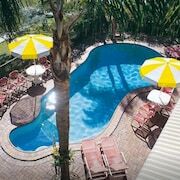 There are a heap of budget accommodations available here, and at the top of our list are the Coolangatta Sands Backpackers and Kirra Beach Tourist Park. What are getaways for if not breaking the budget? The Rainbow Commodore Apartments and Columbia Beachfront Apartments are lastminute.com.au's recommended options for those travellers who don't mind spending a little extra cash. Holidaying with your mates but need a bit of a break? Fancy just chilling out with a mag and a steaming cup of coffee? Then why not find a secluded corner in That Blue House? Trust us, you're gonna need some decent tucker after all that sightseeing. Luckily, THE Jungle Mexican Cantina has a tasty menu which will really put a lining on your tum! If all that tucker has made you a bit thirsty, The Rattle Snake Motel is practically around the corner. It's an awesome place to pull up a stool and mingle with the locals! 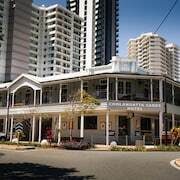 Can't secure the best Coolangatta hotel room? Don't lose hope — there are loads of options in Tweed Heads and Bilinga. 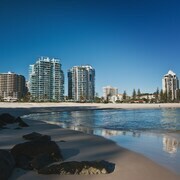 Whether you want your time in Coolangatta to be relaxed or bursting with #TravelEnvy adventures, we'll help you out! Just a few more clicks and you can start stuffing your bags!